Take a look at the easy how to video! You can subscribe to my YouTube channel for lots of easy how-to videos on some of my most popular recipes. 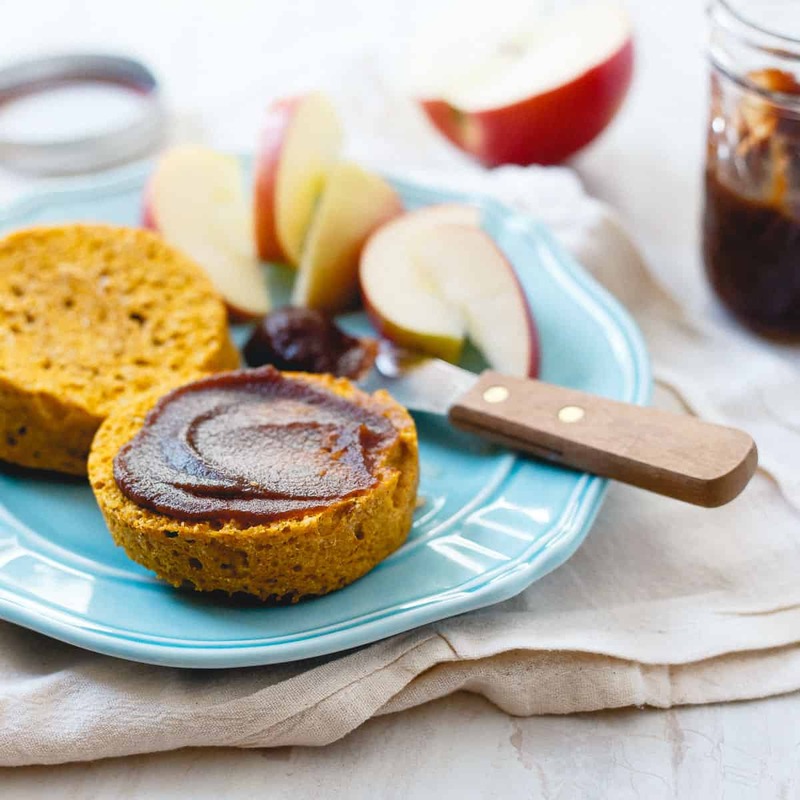 These 2 minute microwave paleo pumpkin english muffins are an easy, grain, gluten and dairy-free option for breakfast. Perfect when toasted! A couple of years ago I went through a paleo phase and when you take away my bread-like carbs for breakfast I either a. get incredibly bitchy or b. persevere and find a way around it. Option “a” lasted for about 2 weeks before option “b” kicked in with this paleo english muffins recipe. I literally lived off those things for months on end. I was going to Trader Joe’s solely to stock up on their awesome cashew flour (it’s my favorite for paleo baking, even better than almond flour I think) so much that my phone started to think it was “work” and would tell me the estimated time to 113 Mill Plain Rd. Danbury, CT (Trader Joe’s address) every time I got in it. I fell out of love with paleo a few months later but we remained friends. Enough so that I decided a fall twist to the 2 minute paleo english muffins was in order this year. 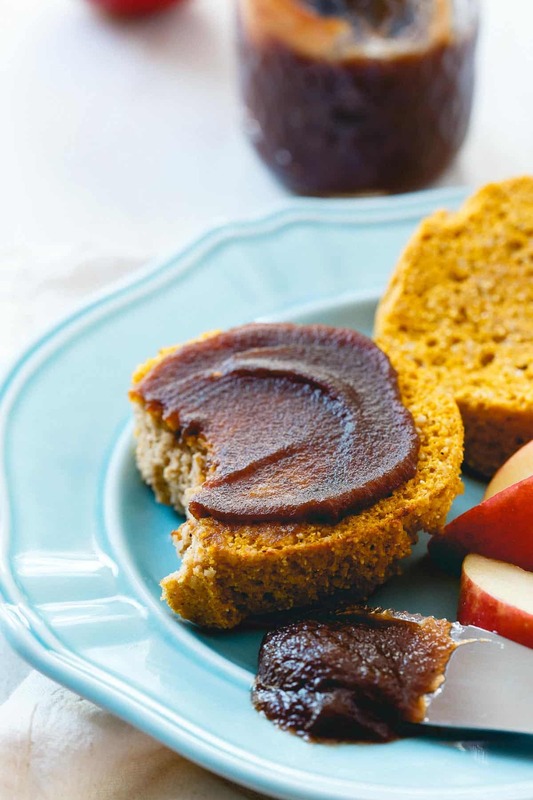 These paleo pumpkin english muffins are a great way to use up that leftover pumpkin in the can that always seems to be hanging around after you’ve baked. Delicious topping possibilities are pretty much endless. 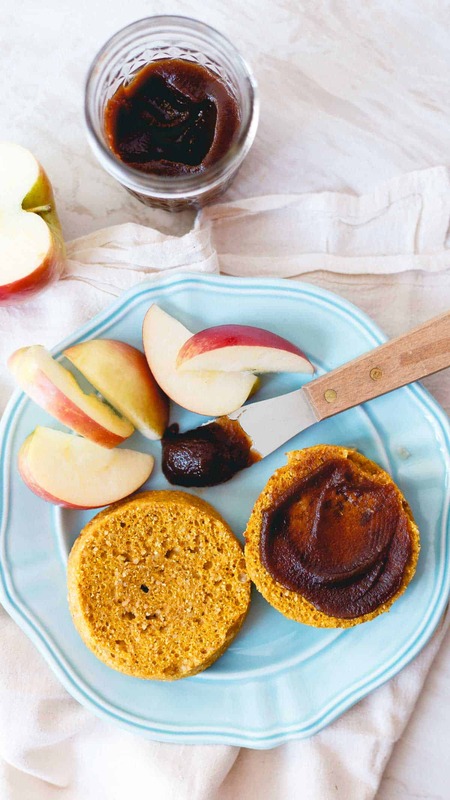 Apple butter is a recent favorite and goes so well with the pumpkin flavor in these english muffins (of course that kind of makes it un-paleo but, whatever). Cream cheese is another baller option especially if you jazzed it up with some cinnamon and honey…mmm. Again, not paleo but primal at least! Hey, you do you on the toppings, nut butter is always a solid choice and fits all paleo diet constraints. My choice would easily be cashew butter. 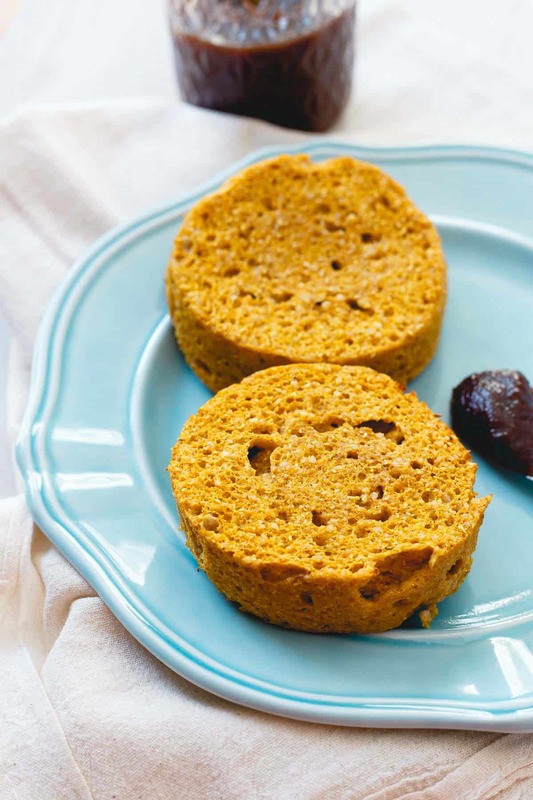 The toasting part is critical with these paleo pumpkin english muffins, don’t skip it. It’s definitely edible straight out of the microwave but toasting it is what gives that perfect crunchy bite and crispy edges just like a real english muffin. Like I showed in the original paleo english muffin post, adding raisins is also a great option. Pumpkin and raisins would go really nicely together. Of course, now that I’m thinking about add-ins, a few mini chocolate chips wouldn’t be the worst idea in the world either. We all know that combination is a definite winner (this pumpkin banana chocolate chip bread and these pumpkin chocolate chip bars prove it!) and any day you can eat chocolate for breakfast has got to be a good one! Combine the flours, baking soda, spices and salt in a small bowl. Add the egg, pumpkin and milk and stir until well combined. Grease a small ramekin with baking spray. Transfer batter into the ramekin, smooth the top and microwave for about 2 minutes (timing will vary by microwave) until puffed up and center is set. Remove from the ramekin, slice in half and toast. These look so good! English muffins are my favorite, but add pumpkin? Yum! Wow, what an awesome recipe for fall Gina! And only two minutes?! I NEED to try these! I want to put pumpkin in everything! LOVE these pumpkin-english-muffins!!! Pumpkin in everything, especially for breakfast! I can’t believe these are made in the microwave! YUM. Wow! these English muffins look so good. Unfortunately, I don’t have a microwave so I will pin this recipe and will try to make these later. I had almost every ingredient for these, so I made one immediately! I had almond flour, and used half and half for the milk. While “English” muffin is not how I would describe this, I definitely would call it a muffin, and a nice, big, puffy one, at that! I like the not-too-sweet taste, but of course, i did put on some butter and organic honey, and liked it that way. i will have to try your other suggestions, all of which sound yummy. I am heading across town to Trader Joe’s soon, and will also have to try their cashew flour. Thanks for that tip! And also, the original recipe for your English muffins. I love trying new recipes, with alternative flours, and after a long vacation eating gluten again, already feel better after a week without it again. So I really appreciate all recipes with nut flours, in particular. This one is a keeper! It is a recipe with pumkin and It takes only 2 minutes to cook. Awesome!!! I will try it. Thank you so much for sharing the recipe!!!! LOVE this recipe! I’ve made it 2 days in a row now. Especially love that it’s so quick! Thanks for sharing this recipe again! It’s so versatile, I’ve put sweet potato in mine with the pumpkin spices and my friends couldn’t get over how delicious it was. Yumm!